Karun Chandhok celebrated an Indian first on Sunday after finishing the Le Mans 24 Hours endurance race in sixth place with his JRM team mates David Brabham and Peter Dumbreck. 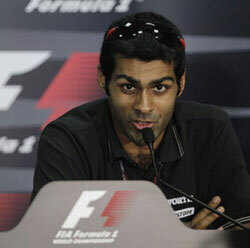 The first Indian to compete in and complete the race, Chandhok had taken his first stint at the wheel with only a few laps of Le Mans under his belt after the team had problems in qualifying with the Honda HPD car. "Driving for nine of the last 36 hours and sleeping for four makes for a pretty tiring ratio," said the ex-Formula One driver after multiple stints at the wheel through the night and day. "I ended up doing the graveyard shift from 2 to 5 a.m. which was very special and exhausting in equal measure. It made me really understand the unique, special nature of this race." Indian Narain Karthikeyan would have been his country's first Le Mans racer after qualifying in 2009 but he hurt his shoulder before the start and did not take part.